One of the greatest portrayals of heroism in comics has to be the stirring sequence from the Master Planner Saga in Amazing Spider-Man where Spidey is trapped under the huge chunk of machinery as the room fills with water. His beloved Aunt May is at death's door and her only hope is a canister of rare isotope which lies just feet from the trapped hero. In an incredible feat of courage he finds the strength and somehow lifts the heavy generator. Then, while fighting his way through The Master Planner's henchmen, he's so weak from exhaustion that he barely realises he's won the fight. 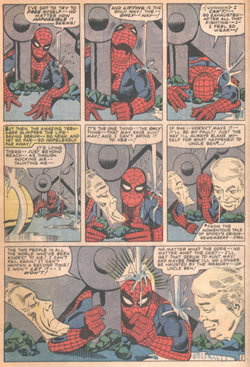 All brilliantly written by Stan Lee and drawn by Steve Ditko. While five pages of Spider-Man trapped beneath machinery and talking to himself sounds kinda boring, the writing and drawing makes it compelling. 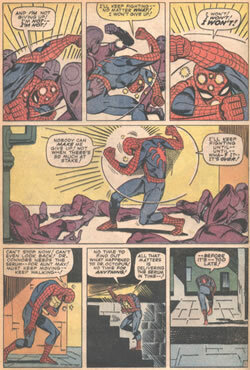 The fight over, Spidey staggers off into the distance clutching at the precious canister that might save his aunt's life.